The Sagrada Familia is one of the most famous monuments in Spain and the most important one in Barcelona. It’s world-renowned, everyone wants to see it, and everyone knows its story. But there are some details that only a few people know. Want to know what they are? 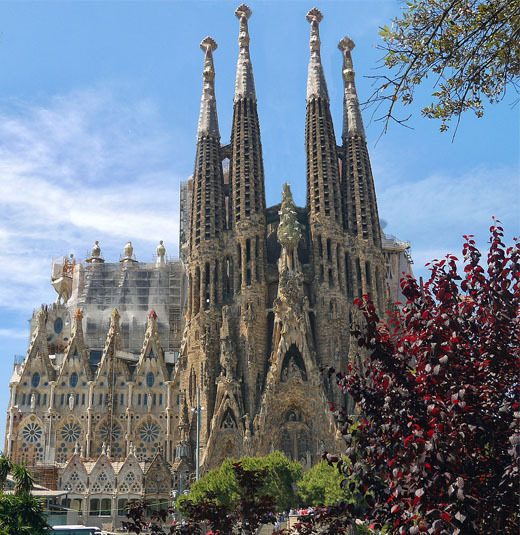 1.As you know the Sagrada Familia is still not finished; but did you know that Gaudi planned to let his work be adapted by new architectural styles that would arise after his death? 2.Initially it was going to be a neo-gothic temple. In fact originally the architect was going to be Francesc de Paula Villar, who ended up rejecting the project because of a disagreement with Barcelona’s city hall. And that’s how the project ended up in Gaudi’s hands! 3.Some of the ideas for this great monument were originally from a different project Gaudi was working on… a hotel that was never built, which would have been located in NYC! 4.Have you noticed that the Sagrada Familia barely uses any straight lines? Gaudi hated them; he said, “in nature, straight lines don’t exist”. 5.There are no original plans or mock-ups for this work of art. All of the sketches and notes that Gaudi made were burnt during the Civil War. 6. Perhaps for this reason there is a certain amount of controversy when it comes to the Sagrada Familia. Some critics think that the works being carried out are too “stylized” and would not be to Gaudi’s liking. 7. Legend has it that during the construction of the Sagrada Familia famous architects such as Gropius went to visit Gaudi to learn the secrets of his construction. But the genius didn’t have time to receive them! Could this be the reason his style is so unique? As you can see, everything has come together perfectly for this monument to be completely unique, and it’s a monument you can’t miss if you’re passing through Barcelona.